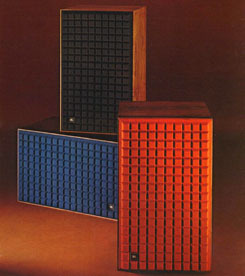 The James B. Lansing L100 Century loudspeaker, the consumer version of the 4310 studio monitor, became the largest selling loudspeaker model of any company in the Seventies and more than 125,000 pairs were sold. By the end of the decade, recording studios in the United States used more of JBL’s monitors than all other brands’ monitors combined. Due to the materials used, the L100 drivers are as good today as when they were produced, but the overall sound can be vastly improved by modern crossover technology. 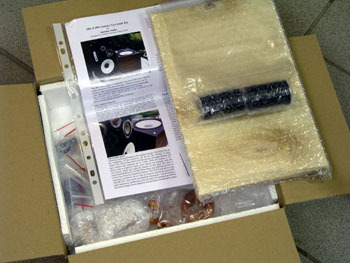 The kit is suitable for those JBL variants using the 123A woofer, LE5-2 midrange driver and LE25/LE26 tweeters, e.g. 4311. For the 4310 (LE20 tweeter) you need 3 additional components. Read below. The crossover is NOT suitable for 4311B, 4312 or 4312B; these have different midrange driver. The L100 Up-Grade Kit is NOT suitable for L166 or any other JBL speaker. I truly admire the work you have done to upgrade the JBL L100 Loudspeaker. It’s sort of like you’ve given an old man a new heart. I am retired now, but I worked in the audio/consumer electronics manufacturing industry for forty years – from 1960 – 2000. During the 1960’s I was Vice-President of Engineering Administration at JBL. I am not an engineer – but I did direct the L100 development program. L100 Design Engineer Ed May was a very dear and close friend. I coordinated the work of industrial design consultant, Arnold Wolf – who, with Doug Warner, was responsible for the visual design. Arnold later went on to become President of JBL and my boss. Larry Phillips created maybe the best audio promotion program ever: “Wednesday for Trombones, Thursday for Drums.” Years later, when I was introduced to Mark Levinson engineer, Tom Colangelo – Tom – smiling when he heard about my past JBL work experience, simply smiled and spoke that now famous marketing phrase. The best L100 story “never told” is that of JBL draftsman/audio enthusiast Carl Davis from Ottumwa, Iowa. Ed May told us all that microphone wind screen foam material would make an acceptable grille material. Arnold Wolf gave us stunning designs. The problem was that the foam industry was basically the packaging and filtering industry. Pressure cutting foam tolerance was about +/- .25 inch. No foam vendor could meet Arnold’s design requirements. Carl Davis, without degree, without assignment and working on weekends – was the first – in the entire industry – to discover that foam could be hot wire cut – and with the required precision. The L100 project had lingered more than six months in limbo while we struggled with the grille design problem. Meanwhile, the L100 market got off to a head start when studios began ordering 50 to 100 pairs of walnut 4310’s. We all knew an unauthorized distribution process was under way. While enjoying the sound from newly renovated JBL L26 Decades, I might as well start writing about the one and only, JBL L100 Century. A month ago one of my friends threw in these speakers, having bought them from an old fellow for 300 DKK (50 US $) - a total give-away. All drivers in mint condition and the cabs with minor scratches. Tweeter foam had gone but can easily be replaced from eBay sellers. 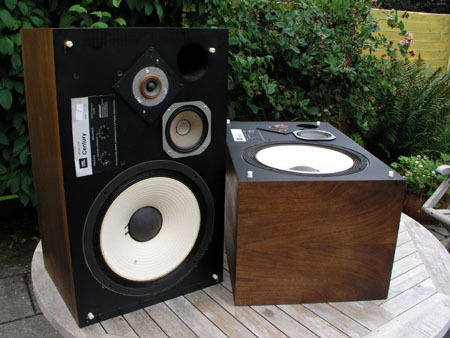 A rare opportunity to measure what the L100 did back then where I could only dream of owing a pair of these speakers from "over there". I don't recall the retail price, but they were very expensive. 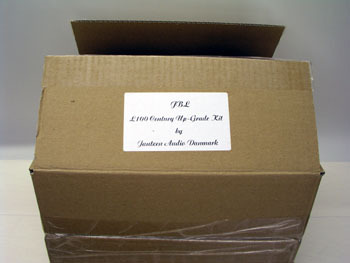 Having recently experienced the SEAS 503 kit, I now realise the 503 kit was actually a better speaker at that time. 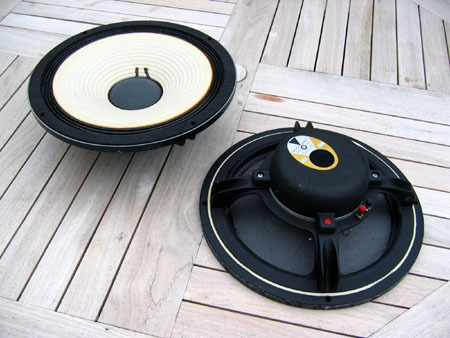 Quite similar in size and power handling, the 503 had a better midrange and a better crossover and the 33FWK bass drivers may beat the 123A drivers. But the SEAS drivers didn't have the gorgeous looks of the JBL drivers, the white-coated cone of the bass driver and the exquisite finish of the LE5-2 driver. I've always had a week spot for the LE5-2 due to how well it is built. Take a look at how the dust cap is glued to the cone and the fine touch of paint around the edges. It takes great skills to make such fine work. However, the LE5-2 is not an easy driver as we shall see later. Left: My friend's JBL L100, some scratches to the cabs, but drivers in mint condition. Right: JBL LE26 tweeter. drivers separately on eBay. 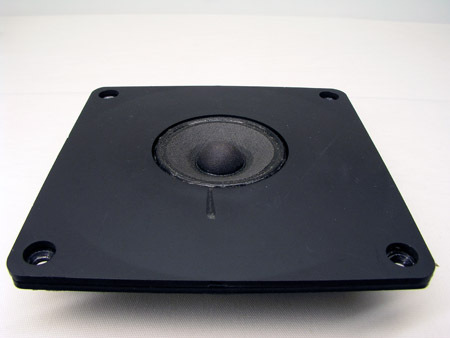 On eBay, sellers will completely strip an L100 speaker and sell it bit by bit down to the pins holding the front grille. Cabinet modelling from TS-data reveals the above seen response profile. Basically the 123A driver has a too high Qt to be used in a vented cabinet and the result from a 44 liter volume is a 3-4 dB increase in response at 70 Hz, which is confirmed by a nearfield reading of the response. 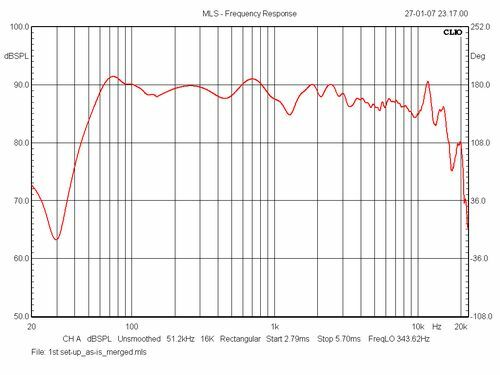 Place the classic L100 Century on the floor, close to a wall, and we will have an overall 7 dB response increase from 50 to 100 Hz. Talk about a boom box! So, two options available. 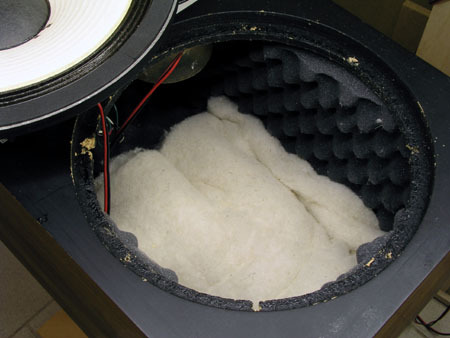 Add some acoustic foam to the vent, lift the speaker some 50 cm from the floor, which will raise the bass driver to ~70 cm from the floor, move it some 100 cm (distance to front panel) out from the rear wall, place in on the long side of the room with 1.5-2 meters to side walls, and we will reduce the bass peak to 3 dB above average level. Much nicer. Placing the L100 in corners is a no-no. Left: Individual response of drivers without crossover. Smooth bass roll-off? Well, maybe not from this cabinet, but take a look below where I compare the 123A response from the L100 cab and a 60 cm wide, curved baffle. The LE5-2 is extremely sensitive. If it hadn't been for the dip around 1 kHz, we would have had 96-98 dB/2.8V sensitivity. The peak at 6.5 kHz needs special attention in the crossover construction. The LE25 is much better than I had anticipated. It doesn't matter much whether the foam is in place or not. It may change the sound, but not measuring performance. File not shown. 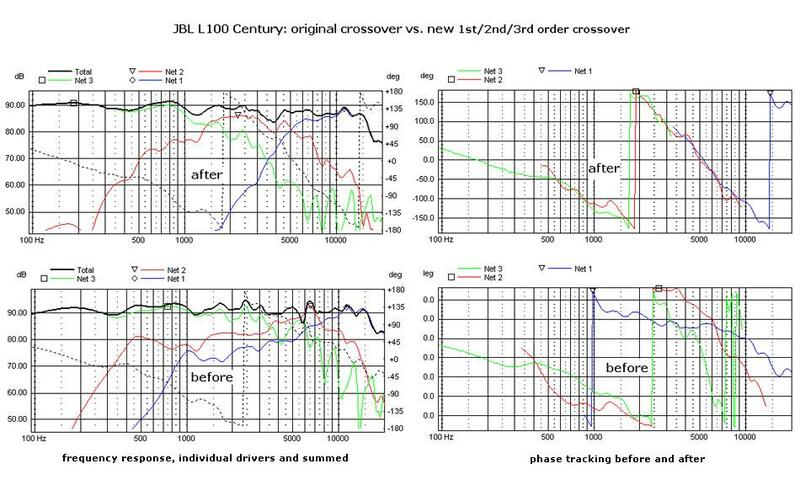 Right: Individual response of drivers from original crossover with mid and tweeter attenuation set to zero. Some serious traffic jam around 3-10 kHz - three drivers all trying to make the most of it here. No wonder the original set-up fails on vocal recordings. The 123A bass drivers really shouldn't try to play upper treble. 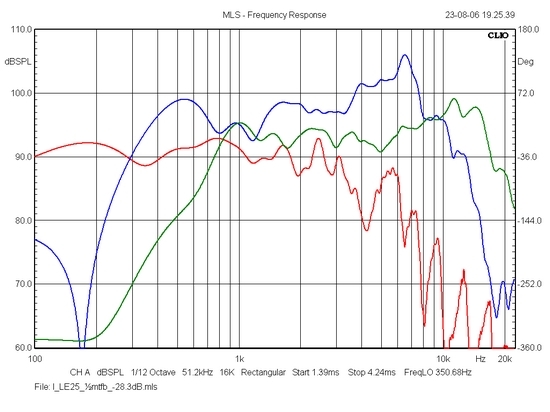 The mid shouldn't peak at 6.5 kHz and some proper low-end roll-off might improve performance. And the tweeter might improve performance from smoothing overall impedance. 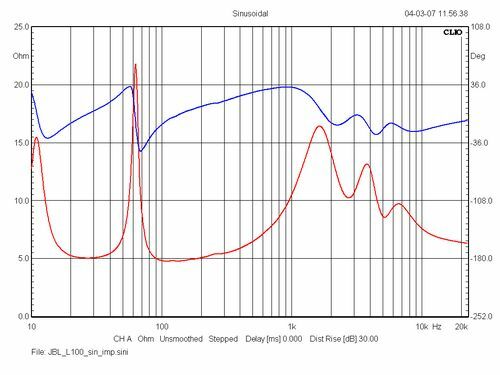 Left: The SPL response of both speakers with "0" attenuation for the tweeter and -3 dB attenuation for the mid to get the terrible peak at 6.5 kHz down to reasonable level. I found this attenuation setting to produce the best overall balanced sound. Nearfield bass response is merged at 350 Hz. Disregard difference in bass response. Probably not correct. Now, listening to some music from this setting may be close to what we heard back then. Quite an experience to hear that JBL L100 sound once again. Good? Hmm... Very impressive, lots of bass, speedy midrange. The sound of acoustic guitars is very good, but vocals? Something is very much wrong in the treble area, the 5-10 kHz range I guess - although I'm strongly biased due to the 6.5 kHz peak. The danger of knowing what is going on. As soon as you know how it performs on paper, you can't help instantly having an opinion about what the sound is like - and what is wrong about it. But the 6.5 kHz peak is most likely the cause of some of the problems of this simplistic crossover set-up. Sibilance is emphasized and you can't attenuate the mid to get rid of the trouble without losing tonal balance. 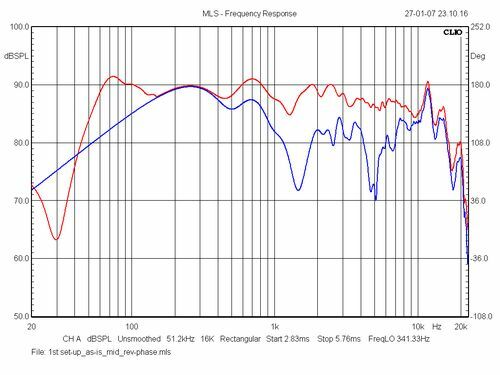 Right: Response of midrange alone with crossover and attenuation set for -3 dB. Severe dip at 1300 Hz and the 6.5 kHz peak..... This looks like a poorly managed tweeter response. A response up to 15 kHz! I mean, a single coil to the mid might at least have produced a more flat response, but then the upper treble may run into trouble from this approach. 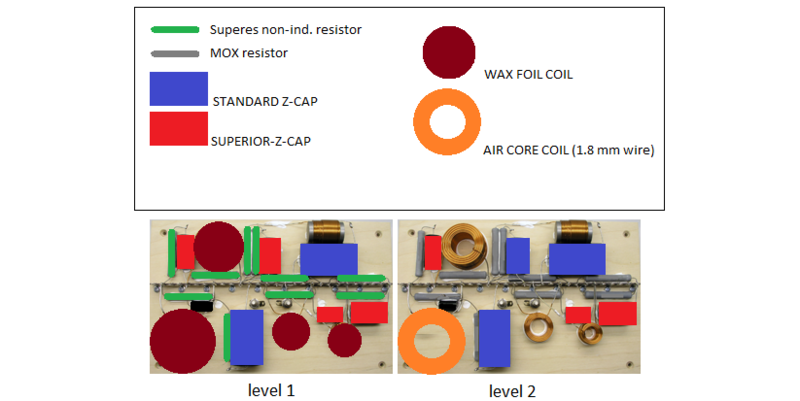 Modelled response of drivers where the drivers are attenuated with two resistors in order to recreate the measured performance. Not that easy, but this is close. 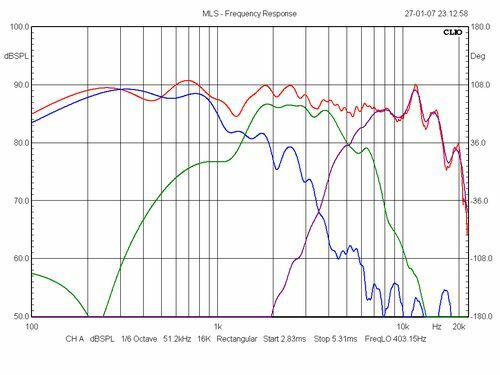 Phase tracking between bass and mid is better that we might expect, but the tweeter is very much living its own life in the upper midrange. When I reverse the polarity of mid and tweeter in the LspCAD, things at least get worse. It's not that bad. Left: Step response showing reverse mid polarity. The strange thing about these drivers is that the red terminal on the 123A bass is correct. The cone moves out when applied positive voltage. The LE5-2 cone in moving inwards when positive voltage is applied to the red terminal. Why would JBL do this? To ensure correct polarity of drivers when plus wires from crossover were connected to drivers? But the LE5 was used in other constructions... Doesn't make sense. 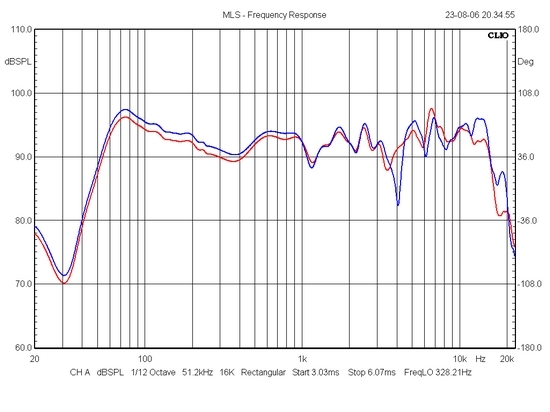 Right: Mid attenuation fixed at -3 dB and tweeter response shown from +3 dB, 0 dB and -3 dB settings. 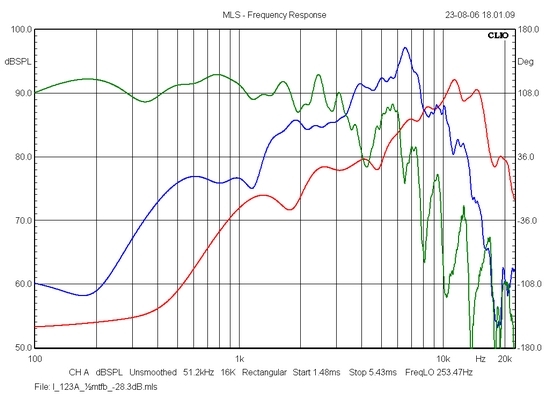 Left: Mid response from attenuation at -3 dB, 0 dB and + 3 dB. 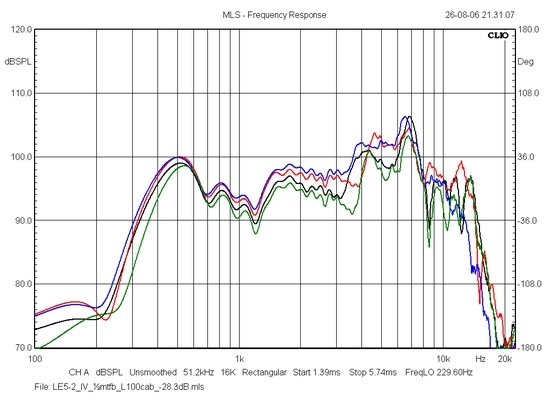 Red = summed response from mid attenuation at -3 dB. If you run the L100 from "mid +3 dB" it'll rip off your ears! Right: The 123A bass in L100 cab, blue, and from a wide curved baffle (red). Now, find a 12" driver today that will perform flat up to 6 kHz and have a smooth roll-off. Remarkable! Left: I have two LE5-2 drivers asigned my future L100 reconstruction. So my friend's L100 gave me an opportunity to compare four LE5-2 drivers - and there's some difference! 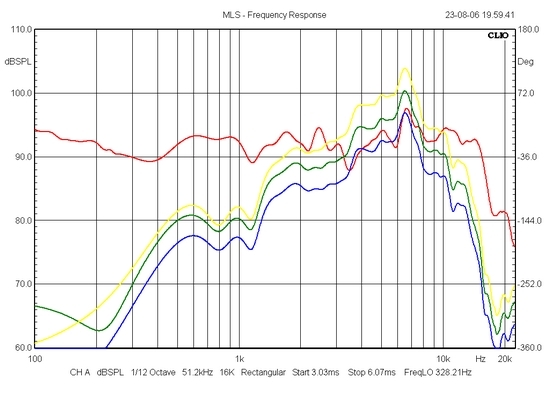 In the upper midrange we have some 4 dB difference in sensitivity. Basically this is due to differences in voice coil impedance. Right: Impedance of four LE5-2 drivers. From 5 to 7 ohms. Unfortunately both my friend and I have one of each and the cones are so different in colour that we can't swap drivers. If you ever buy LE5-2 drivers on eBay, be sure to have a DCR reading of both drivers before bidding. A new crossover designed for all variants of LE5-2 drivers is a challenge and fortunately it can be done due to the very high sensitivity of the middriver. Placing a resistor before the driver will increase impedance and the kit crossover will have a deviation in midrange level of +/- 1 dB from the shown drivers. This is manageable and for those who want to do some fine-tuning, the mid level may be increased or decreased by the input resistor. Problem solved. A lot of work has gone into designing a new crossover and numerous simulations and actual crossover constructions have been tried in order to try taming the LE5-2 middriver and provide an overall balanced sound from the L100. What I wanted was to maintain the basic virtues of the L100, i.e. the 123A bass driver working - almost - full range, thus a 1st order filter was soon in place. 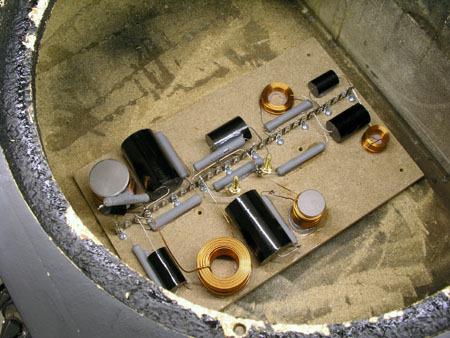 To maintain 1st order filtering as high up in frequency as possible, the LE5-2 had an LCR circuit to flatten the rise in impedance at Fs, allowing the high-pass section to be one single capacitor. To cope with amplitude and phase between mid and tweeter, the mid needs a 2nd order low-pass section and the LE25 needs a 3rd order filter at 5 kHz to get amplitude and phase in place. See graphs below. 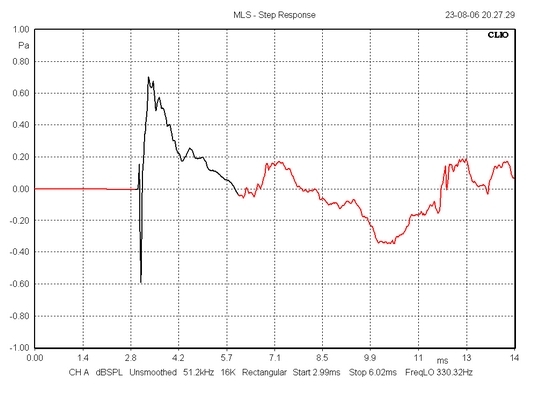 Three significant things have happened here: First of all, the LE5-2 middriver no longer peaks at 6.5 kHz. Secondly the mid-section was constructed in such a way that the common variation in driver impedance (LE5-2) only produce minor deviation from target response. Last but not least, both the tweeter and mid now produce a smooth roll-off below points of crossover. Should you want to increase mid and tweeter levels, you may bypass R2011 (mid) and increase R1061 (tweeter) from 4R7 to 5R6. Both 4R7 and 5R6 are supplied with the kit for you to esperiment. New crossover topology. Pay notice to terminal lay-out of JBL drivers. Please note this is a commercial kits. Component values comes with the instruction manual. Use a 1.5V battery and connect to driver's terminals (only for ~½ second). When a positive voltage is applied to a terminal and the cone moves outwards, then you have found the PLUS terminal. Attenuators have a bad reputation, but usually from failing after many years of service. From my own experiments new attenuators do not degrade the sound as such. Whether your JBL attenuators need replacing is hard to say, but if you can turn them fully without pops or cracks, they're probably OK and you can wire as seen below. For replacements you need to go to eBay and source similar products. Fostex has some nice products, but not cheap at all. https://www.ebay.co.uk, and 100 watt is more than enough. 20-50 watts is more than enough. Above the wiring in case you want to maintain the attenuators. 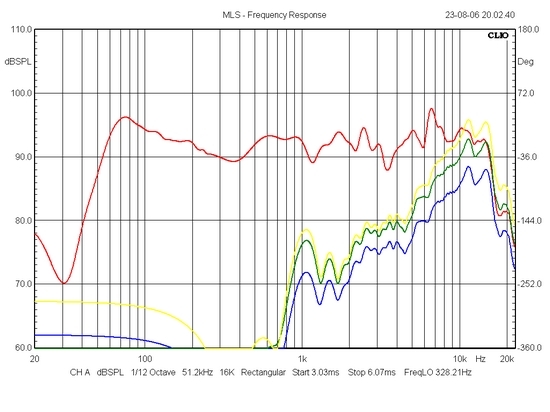 I suggest then picking the lowest level of fixed attenuation for midrange and tweeter, leaving some headroom for both. 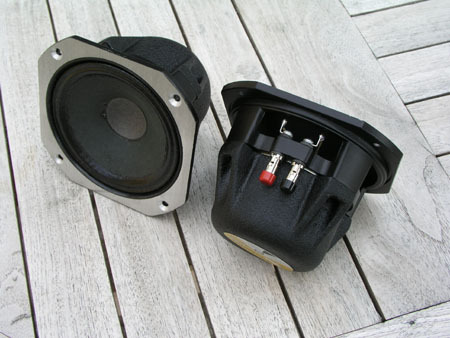 For the midrange R2011 is reduced to 1.0 Ohm and for tweeter R1061 increased to 10 Ohm. 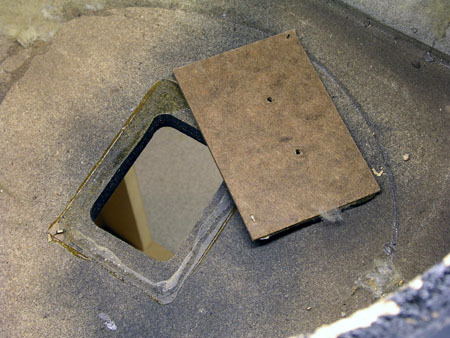 Remove old terminals including the thin masonite panel. 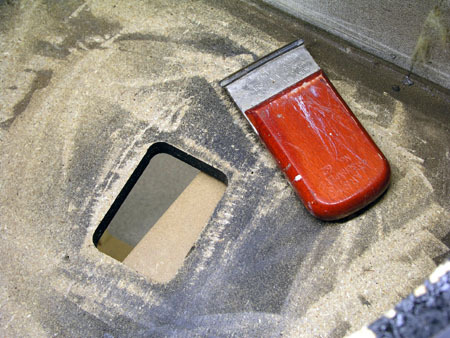 Scrape off residual glue and sand the rear cabinet panel to make a smooth surface. Crossover components for one speaker. 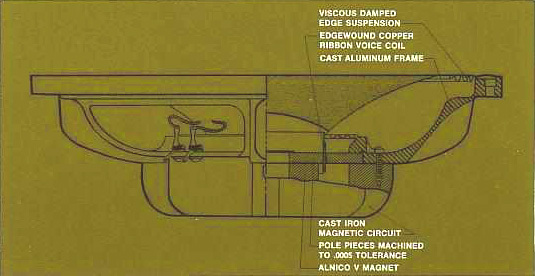 Level 4 components shown. The crossover layout was changed since this early prototype. View below. Left: Trying out the crossover/terminal board. Right: New damping material and after installing the new crossover, a piece 30 x 60 cm Acoustilux is folded and placed on top of crossover. 1. 180 x 280 x 12 mm birch plywood boards for terminals and crossover. 3. Two extra resistors for tweeter attenuation. 5. 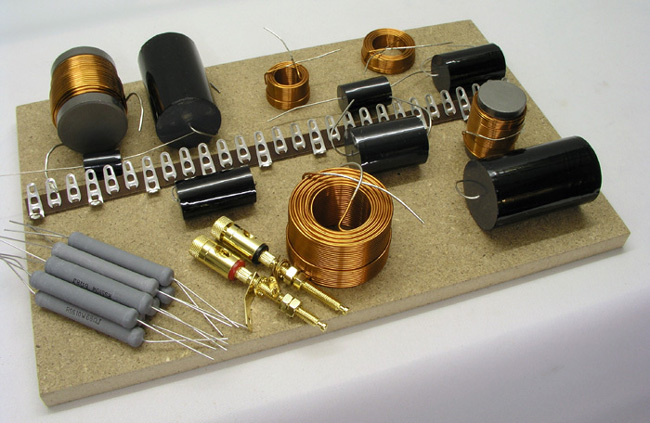 All crossover components: Baked non-resonant coils, all polypropylene capacitors, MOX/Superes resistors and cables for connecting drivers. 6. Kit instruction containing crossover schematics, a short version of this page and large sharp photos of the assembled crossover board. The kit does not come pre-assembled. Not supplied is silicone glue and screws. It's highly recommended to replace the old damping material. The kit price is set at a level where you cannot buy similar quality components at a lower price from any supplier. 6-page instruction manual following the kit. Example of Level 1 Crossover wiring. Wiring is the same for all levels. 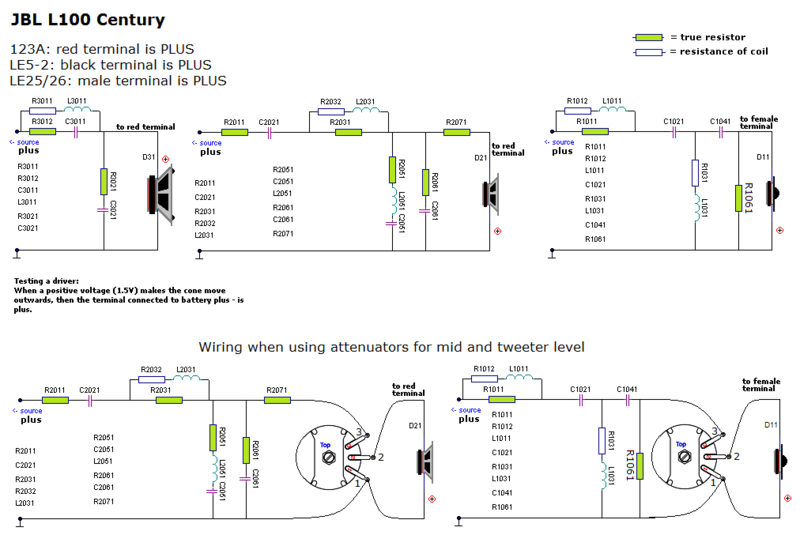 The dotted lines from tweeter attenuation resistors means that only one of these resistors must be connected to ground. The LE20 tweeter is quite different from the LE25 and LE26 tweeters, thus needs a different crossover. 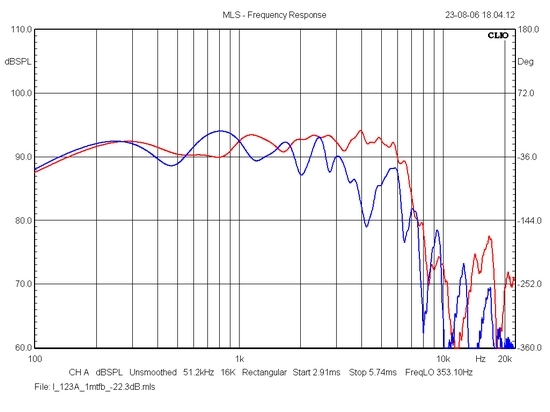 Left: L100 frequency response from new crossover. The dip at 1.3 kHz is caused by the small front panel. Some of the LE25 tweeters display a peak at 12 kHz. Some do not. However, I must say the treble from the renovated L100 is remarkably smooth. If your L25 tweeters are intact, do not discard. They're excellent tweeters - only need a proper crossover. 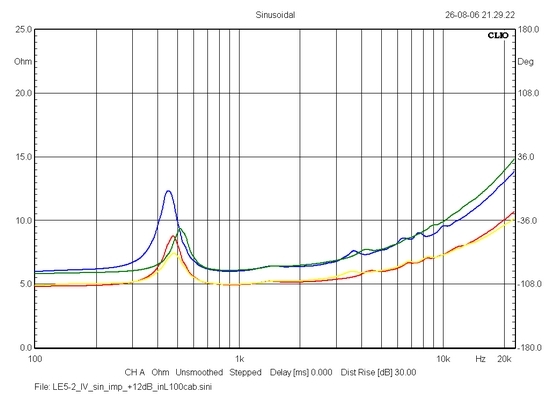 Right: Summed frequency response, red, and response of individual drivers from new crossover. All drivers now display smooth roll-off characteristics. Left:The litmus test: Reverse mid polarity. Reading taken a 1 m distance at middriver height. Due to placement of drivers, this reading may somewhat depend on placement of microphone. In my own recreation of the L100 I'll have a standard vertical placement of drivers with mid and tweeter slightly off-set. Right: System impedance from vented cabinet. 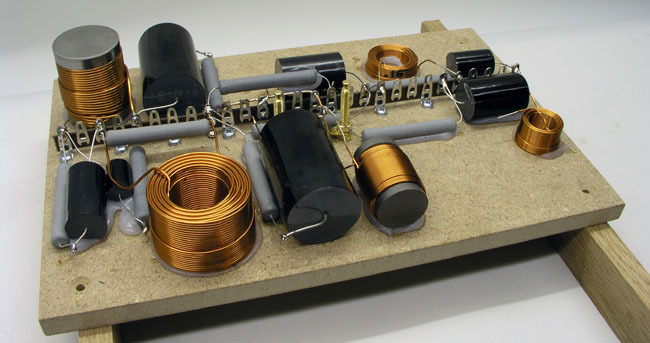 This is an overall easy load on our amplifiers. 5 ohms minimum impedance and the negative phase angle at 70 Hz is where impedance is high. I dare say it's quite a different speaker compared to the previous "two-caps" set-up. Classical music is a delight, vocals are handled very well and should you throw a Saturday evening party, give it a 150 wpc amp and let it rock! It runs well from my 20 wpc PSE valve amps, though not at very high levels. One last thing: The L100s need stands, at least 45 cm in height to bring the 123A drivers off the floor. Remember, the 123A is handling most of the midrange and a 5 deg. tilt is doing even better. I used the stands I made for the L26-3W. Some comments on L100 placement: The new crossover is tuned to a placement like most modern speakers and due to the high-Qt bass driver we already have some +3 dB in the 50-100 Hz range. If the first option below is the only way you can place your speakers, don't up-grade. We need the bass driver up and out. From the new crossover, the 123A bass driver still handles most of the midrange, thus 40 cm from floor level is not a good idea. I recall studios using the 4311 and 4312 upside-down to get the 123A at ear-height. This is a no-no with regard to placement. Too close to the floor and front wall and too close to the corner (for right speaker). Based on simulation you will have +9 dB at 60-70 Hz. Way too boomy. This German up-grader got it right: Free of nearby boundaries and a much smoother response.